Acne is believed to be a serious issue since ages! These can be embarrassing at times and these acne can develop into a problematic issue if not dealt with precautions and care. There is a lot of debate over exercising and acne, so is there any relation to this? Let’s find out. Exercising has always been a vital part for human life, exercising keeps one healthy and active, and the aggression and workout generates sweat! This sweat produced is parent of acne. Sweat and sebum (oil secreted from dermal cells) are secreted from same pores and hence this tends to clog the skin. Exercises involve a rapid secretion of sweat which ultimately clogs the pores. Stress, Hormones and Diet are the major driving forces of acne. The hormones are the major culprits which often sprout up in form of acne. Stress and hormonal imbalances often turn up their aggression over skin by bubbling up an acne region. 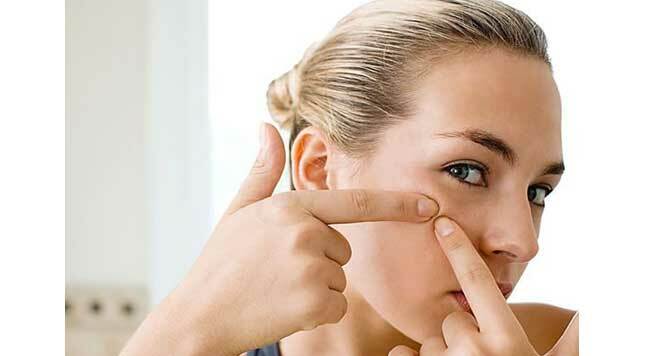 Often the bubbling teen years see the acne-period because of the hormonal gradation in the body. Eat right, and staying away from oily food are some golden mantras of wooing away your acne problems. Oily food is another causing factor of acne, which allows more deposition and irritation on dermal layer. Hygiene is another major driving actor, if your skin is prone to acne more, you have to be cautious and should be regular in washing up face and apply medications. So quitting your exercise routine is not the option right? Because exercising is not the problem but the secretion of sweat build up acne problems. Hence an immediate bath, and body washing is necessary after you exercise. Commonly the secretion of sweat and sebum takes place from same pores and hence this clogging of pores takes place which result in mighty acne. Taking precautions for cleaning and wiping oneself is most important .Use of medicated scrubs or body washes to sanitize your oily body and face can clean those clogged and closed pores on your skin. Scrubs are an amazing option; gently rubbing the scrub over your face will eventually clean your pores and hence will help in dealing with sebum and sweat. So, when next time you hear about any relations with exercise and acne problems, you know why and how to ease out the topic! Exercise and eat right and cleanse yourself properly for no such acne problem will ever exist.